Available later in 2016, the clean, responsive, Ingenium diesel uses state-of-the-art technologies including selective catalytic reduction (SCR) and low-pressure exhaust gas recirculation (EGR) to cut NOx and CO2emissions. The all-new F-PACE range will consist of: F-PACE, F-PACE Premium, F-PACE Prestige, F-PACE R-Sport, F-PACE S and F-PACE First Edition. The powertrain range will consist of a 180hp 2.0-liter Ingenium diesel as well as 340hp and 380hp 3.0-liter V6 gas variants priced from $40,9907, $42,3907 and $56,7007respectively. 1 Do not use Jaguar InControl® features under conditions that will affect your safety or the safety of others. Driving while distracted can result in loss of vehicle control. 2 These features are not a substitute for driving safely with due care and attention and will not function under all circumstances, speeds, weather and road conditions, etc. Driver should not assume that these features will correct errors of judgment in driving. Please consult the owner's manual or your local authorized Jaguar Retailer for more details. 4 Class is cars sold by luxury automobile brands and claim is based on total package of warranty, maintenance and other coverage programs. 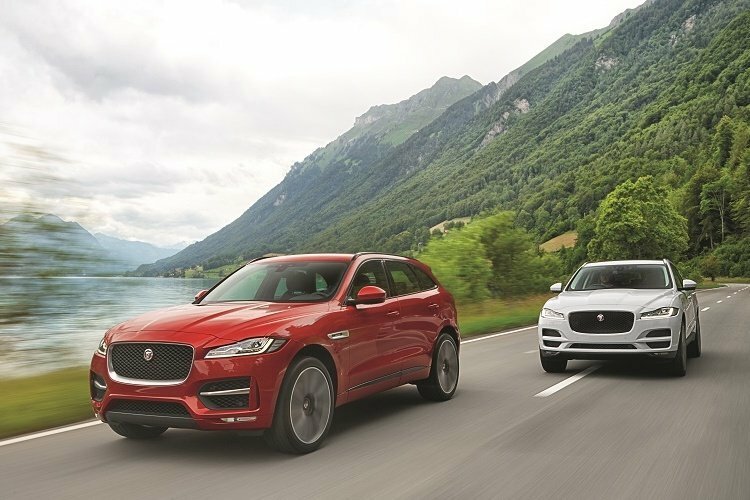 For complete details regarding Jaguar EliteCare coverage, please visit JAGUARUSA.COM, call 1.800.4.JAGUAR or visit your local Jaguar Retailer." 5 All figures are Manufacturer's fuel economy estimates. Actual mileage may vary. EPA estimates not available at time of publication. See your local authorized Jaguar Retailer for updated EPA estimates. 6Diesel powertrain available later in 2016. 7 All prices shown are Manufacturer's Suggested Retail Price. Excludes $995 destination/handling charge, tax, title, license, and retailer fees, all due at signing, and optional equipment. Retailer price, terms and vehicle availability may vary. See your local authorized Jaguar Retailer for details. 9 Driving while distracted can result in loss of vehicle control. Do not operate, adjust or view the navigation or multimedia systems under conditions that will affect your safety or the safety of others. Only use mobile phones, and other devices, even with voice commands, when it is safe to do so. Jaguar is a premier manufacturer of luxury sedans and sports cars offering unparalleled design with tremendous performance. The company's vision throughout its storied history has been simple: To produce beautiful, fast cars that are desired the world over. Jaguar strives to provide a world class ownership experience to every owner. Today's Jaguar lineup consists of the Jaguar XE, two-seater F-TYPE, XF sports sedan, and the XJ luxury sedan. Jaguar -designs, engineers and manufactures exclusively in the United Kingdom, at the Castle Bromwich manufacturing plant in the British Midlands. Jaguar is fully engaged with sustainability initiatives and social concerns with continuous involvement in environmental and community programs. For more information visit the official Jaguar website at www.jaguarusa.com.